Neer dosa/ Malabar Style Appam is an easy but tasty breakfast famous in malabar areas in the name malabar appam and known as neer dosa in Karnataka/ Tamilnadu areas. whatever the name , i can assure one thing that neer dosa/ malabar style appam is a tasty breakfast apart from our normal breakfast items. It is a very simple procedure using the commonly available pachari/dosa rice ,soaked and mixed with shredded coconut. You can enjoy the amazing flavour of rice and the goodness of coconut when you take a grab on it. 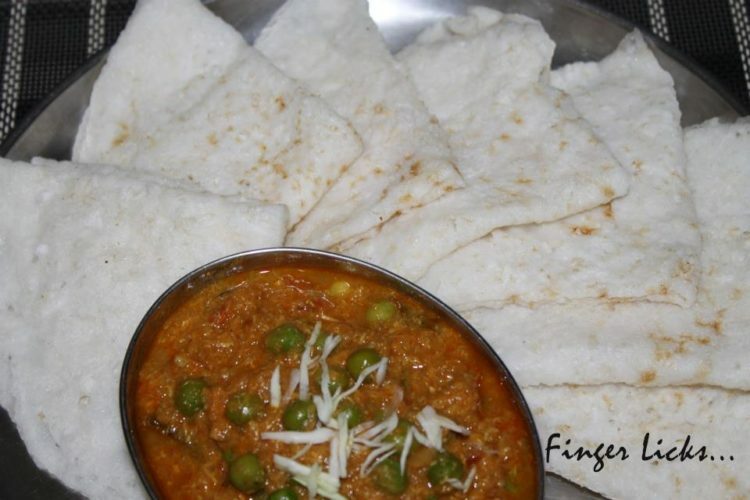 we can serve neer dosa with any side gravies. Soak the raw rice/Pachari in water for a minimum of 4 hour (It is better to soak the rice at overnight and grind in the morning). The batter can be used soon after grinding as no fermentation is required. Grind it along with shredded coconut to get a smooth batter. Add salt and more water to make it to a watery consistency. It should be much thinner than the regular dosa batter. Heat a tawa and grease with oil. Pour a ladle of batter and swirl the tawa immediately so that the batter forms a uniform thin layer on the tawa. Cover with the lid. After few minutes check the dosa. When the dosa is cooked, transfer to a plate. Batter for Neer dosa can also made easily by just mix roasted rice flour, shredded coconut, salt with enough water .